Plaid Cymru has revealed the most radical image overhaul in its history at its spring conference in Carmarthen. The party is dropping its traditional colour and logo and will no longer use the word Cymru, Welsh for Wales. The "triban" emblem is replaced by a poppy, and the logo's green colour is changed to yellow. 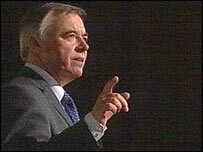 Meanwhile, the party's assembly leader Ieuan Wyn Jones has been voted overall leader by party members although Dafydd Iwan will remain president. For decades, Plaid Cymru has been associated with the colour green, believed to signify Wales' landscape and the party's environmental credentials. 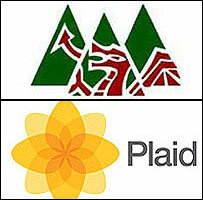 The triban logo has been used since 1933 with the peaks representing what Plaid calls key values: self-government, cultural prosperity and economic prosperity. The new logo is based on the Welsh poppy (meconopsis cambrica) a yellow flower that is indigenous to Europe. The party will no longer use the word "Cymru" on its branding, but its full name remains "Plaid Cymru - the Party of Wales". Director of elections Adam Price, who led the revamping process, said: "The triban was one of the first political visual logos - it has served the party well. "However, we felt we needed a new image befitting the 21st Century." He added: "Our new identity is based on organic growth which will help us in our aim of broadening our appeal as a party". At the launch of the new logo, Mr Iwan said that Plaid hopes the changes, along with a six-month policy review, would show voters that "if Wales is to be successful in the modern world, then Plaid Cymru is the only political force that can achieve that aspiration". We ask people in Aberystwyth for their response to the new Plaid logo. He added: "The London-based parties will never be able to devote their full attention to the needs of Wales." Mr Iwan said the re-branding exercise was "a new start" for the party, adding: "Everything has to re-brand itself every now and again." Also on Friday, the party voted to make assembly leader Mr Jones the new overall leader of Plaid Cymru - a role he gave up nearly three years ago. The party president remains Mr Iwan but Mr Jones said: "I will be the overall public leader of the party leading the 2007 (assembly) campaign. "It is a re-definition of roles which has been much needed in the party." Plaid opponents criticised the changes. The Conservatives' assembly leader, Nick Bourne, said: "It has been clear for some time that the nationalists lack direction, fresh thinking and real leadership. "Plaid Cymru is only going in one direction and that is backwards." Liberal Democrat AM Jenny Randerson added: "Plaid's re-branding exercise is a bit like repainting your house, while ignoring the fact that the foundations are crumbling. "It's not a new logo that Plaid Cymru needs. It's a new agenda."